Techs carry with them an assortment of specialised tools, from wire cutters, to a basic knife, to full blown, 30 lb "iRobot 310 SUGV" man-portable bot. KATHRYN BIGELOW’S FILMIC portrayal of US military bomb techs in the film Hurt Locker would have you erroneously believing (among other things) that the life of a bomb tech is an endless series of deployments, cowboy antics, and ditching bomb suits to “die comfortable”. The truth is that it is more practice, practice, and more practice. An average bomb tech might go through years of schooling and training just to “reduce” — the term they use for disarming — a bomb from a hundred yards away with the help of a robot and an XBox controller, and the US Air Force have posted shots which shed some light on this process. They’ve got the steady hands of a surgeon and the sharp minds of the world’s best pilots, but everything still must be planned and practiced in intricate detail. The same goes for our own Defence Forces bomb squad, as they go through similar amounts of rigorous training. Of course with any training, there is extensive planning. There's also the bomb suit: weighing in at almost 100 pounds, internal cooling systems prevent total melt downs. Along with the suit, techs carry with them an assortment of specialized tools, from wire cutters, to a basic knife, to full blown, 30 lb "iRobot 310 SUGV" man-portable bot. Military grade metal detectors provide a clear path once techs dismount from armoured vehicles on the scene. These types of systems are not for finding rings at the beach. Each is specifically calibrated for specific threats. Depending on the threat, teams typically deploy the robot to get a better look. A 9-Volt battery can easily trigger a blasting cap, which in turn can trigger larger ordnance. Practice deploying the robot cuts down on the teams exposure to hostile situations. There are often small competitions between the techs to see who can better maneuver the bot. The Air Force notes that "since most of the robot controllers are the junior ranking personnel, video game controllers provide a familiar setting to operate". 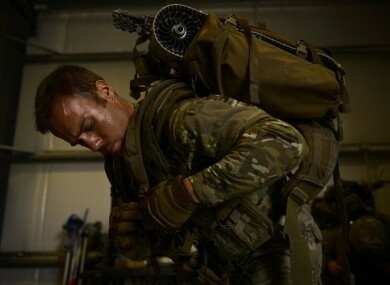 The Air Force describes the bot as "a man-portable robot with dexterous manipulator or claw and wearable controller for dismounted mobile operations". Techs are also savvy on the military's high-grade range finder binoculars. Getting eyes on the target is key. Still, there are many times that only a human can do the looking. Which can, and does, get a bit dicy. Luckily this is only training. The nature of counter-insurgency means that jerry-rigged weapons end up in hard to reach places. Inert props serve as a training reminder that something as small as a cell phone can be deadly when it comes to bombs. ... before charting that course home. They may be the Air Force, but they still operate on the ground. Email “Pics: This is what a day of military bomb squad training is like”. Feedback on “Pics: This is what a day of military bomb squad training is like”.